In August 2015, I decided to go on a journey, an ayahuasca journey. This medicine containing what is known as the spirit molecule, peaked my interest the prior year. I don’t quite recall how it came into my awareness but it felt like something I would like to experience. I had never taken psychedelics growing up in fear of losing control, so I lacked a reference point. I researched and spoke with many people over the year and their experiences were fairly positive. As far as I knew, I would have to attend a retreat in Peru or Costa Rica to take this journey. But, as the universe would have it, I encountered a whirlwind of opportunity in alignment with my desire, leading me toward ayahuasca. One Summers night, I befriended a man at a farmers market who happened to lead ayahuasca ceremonies for medicinal purposes. They were held at a Native American church right in my neighborhood. 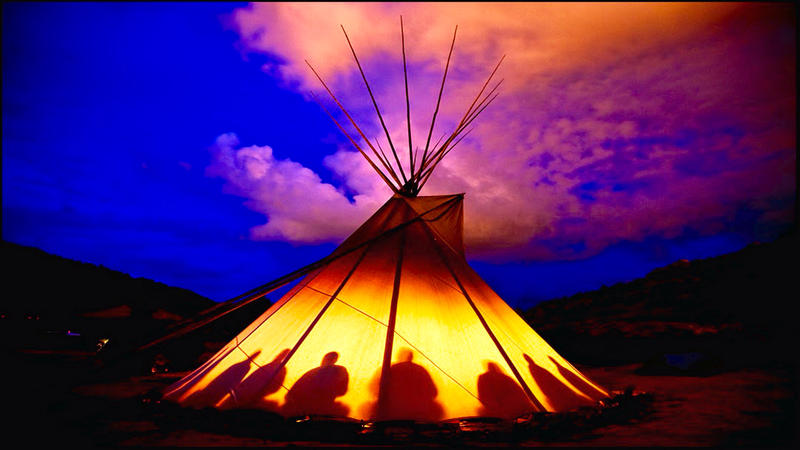 Only a few nights prior I had written a “bliss list” with Native American ceremonies and rituals included on that list. I believe it to be one of my past lifetimes as it has resonated with me deeply. A couple days later, a friend who had accompanied me to the farmers market, called to say there would be a ceremony an hour away led by a Shaman from Brazil before he returned home. There were fifty people going. At that moment I knew I was being led on the right path, and opportunity was knocking on my door. I didn’t have to go to Perú after all. Last Saturday I went on my own, into the woods, to this incredible barn filled with people dressed all in white. Sacred art hung from the walls, a beautiful alter with flowers was created from each person who attended, and all were ready and eager to have this awakening. The ceremony was to begin around 7:30pm and end around 7:30am the following morning. The Shaman informed us he would be administering a tobacco blown up the nose to open the pineal gland and herbal eye drops used for visions which burned for several minutes prior to drinking the ayahuasca. He said if we decide not to take those two medicines it was a decision they would respect but everyone would drink the ayahuasca. Out of the fifty people in the room, I was the only one who decided not to take them. One man tried to persuade me otherwise, but luckily I trust my knowing of what is right for me. Honestly, the grounding and third eye access they were all seeking prior to taking the ayahuasca, I feel like I already have from my Avatar training. I watched for twenty minutes as they spit and gagged into their buckets and lay in pain from the eye drops afterwards. I was glad I had opted out. I sent love and appreciation throughout the room. The Shaman was steady and wise with such a great seriousness, yet also conveyed a sense of compassion. About a half hour later the ayahuasca was distributed. The men and women stood in separate lines waiting to receive the medicinal tea. I had heard the taste wasn’t pleaseant but it didn’t bother me. I went back to my chair with my pillow and blankets ready and waiting to have this experience. At first nothing was happening and I sat back enjoying the singing and drums. Then about 20 minutes later, I noticed tears streaming down my face and I was in the middle of a conversation with God. I have had access to what I believe to be my spirit guides this past year and have had an increased connection with God through prayer and gratitude, but never that direct link. He told me I haven’t had access because I have insisted on being in control. I told him I have been alone ever since my Mom died and when all I have is me, I have to be in control. He insisted that was not true and that he was there for me. I told him I couldn’t feel that and he suggested I let go. The tears kept coming. I was in and out of nausea and determined not to throw up. He told me that was part of needing to have control. I used my consciousness tools from The Avatar Course to feel my way through and direct my attention out when needed. As the nausea began to clear I surrendered more control but not completely. The amazing part was even as I came down and out of this state hours later, I still had a direct dialogue with God running and that made me really happy. If I had left with just that, I would have been satisfied. Around 2am it was time for the second round. This time the nausea was greater but I was determined not to throw up like everyone else. God assured me I was no different than them and that it was my need for control creating the separation. He spoke about Avatar. He told me to spread it everywhere and it was what the world needed. He told me these people and all people believe they have to suffer to have results because they don’t have Avatar yet. The nausea finally crept upward and God said you are afraid of being embarrassed, you are resisting letting go. So I grabbed my bucket and went outside. As I was throwing up God was still talking to me saying, “see, you are not alone and don’t you feel so much better?” I did feel better. A lot better. Like a whole lifetime of needing control and feeling like I had to do it alone washed away. My muscles loosened, my jaw unclenched and I stood in awe of the night sky and the feeling that washed over me. God said “did you really think I would create this for you and not give you access to the creator?” I was at peace. The last few hours they began offering a medicine delivered from the skin of a tree frog from the jungle and seared into the arm or leg. I didn’t do that one either. I watched as people got violently sick for hours. I couldn’t believe they were willingly putting themselves through this to “feel better”. I asked one man who took me under his wing in the beginning why he kept coming back. He said “to feel good.” With the Avatar tools they could always feel good and not have to feel bad or take a substance to do so….if they wanted to choose an easier path. I made my way outside and watched and waited by the fire for the sun to come up while they completed their experiences. I was in bliss, experiencing the beauty and magnificence of this Earth. As morning arrived I was amazed to see that each person felt incredible. Some shared their experiences and they were profound. People who had been incredibly sick fighting the darkness within themselves throughout the night, were bright eyed, present, happy and free. Once again, same kind of results people experience from an Avatar course but without the sickness, substances or pain to get them there. My sense of peace has continued to expand and my constant dialogue with God is still there, I’m not alone. I feel I was there that night to open up that channel, let go, stop resisting, and realize people need to know they don’t have to suffer over and over again to experience awakening. There were many sick people in the room that night but there were also some bright lights in there as well. People don’t know what they don’t know, and it is my/our job to at least let them know it can be different. My need for control is totally gone. My egos insistence to have it “my way” has disappeared. My need for a relationship is surrendered. My desire to control and calculate how each moment of my life is designed is non-existent. My awareness has increased and my desire to help a mind identified world step into the spiritual realm has grown. My love for humanity is greater. My life purpose as an awakener is solid. I will not be doing ayahuasca again for the experience. As an intelligent medicine that has helped heal people from many illnesses, I may reconsider it if I were presented with something I could not heal with what I already have access to. What I do have in my possession is a gentle, effective and loving way to have a spiritual awakening and the tools to make it last. If you are desiring the gentlest way to reach higher states of consciousness then search no further, The Avatar Course is what you are seeking <3. Wow Karen! What an experience! I saw this ritual in a movie and I wondered where someone could experience it. ? you gave me an answer, and thank you for the beautiful written post! ? Thank you Ariane. As anything else in life, we can’t “know” until we experience it :).